This brings back memories — weird ones. The photo to the left is one you’ll only see here, in my first column for Gambling Times magazine in the early 1980s and, believe it or not, in the original printing of Doyle Brunson’s Super/System — A Course in Power Poker. Wait! Doyle’s book wasn’t actually called Super/System on the first printing in 1977. Its title was: How I Made Over $1,000,000 Playing Poker. You might have thought it’s original selling price of $100 was high back then, but if you have a copy in good condition today, it will probably command $500 and skyward. There was actually a valid poker reason for looking the way I did back then. And it’s a reason you should keep in mind next time you play. My appearance provided me with extra calls — plenty of them! I could make a couple bizarre plays, in keeping with my hippie look, then sit back and choose hands selectively. Whenever I had an advantage, I could make extra bets and raises and get called. And I usually didn’t have to fear someone going to war with me, because opponents were terrified. Terrified by the uncertain nature of my probable actions, suggested by my looks and demeanor. They would let me steer the ship and react by calling far more often and, at the same time, fail to take full advantage when they had me beat. It was perfect! And there’s the poker lesson: Players who seem unpredictable terrify their opponents and win more money by getting called more often. Since calling too often is already the greatest weakness of most opponents, you should take advantage by bringing an image to the table that exaggerates their biggest mistake. You don’t have to dress like a hippie to do it, but if you can portray yourself as a little flaky or irresponsible about your decision making, profit will flow your way. It doesn’t matter how you convey an unpredictable image. Just find a way that’s at least somewhat comfortable for you, whether it’s acting dumb, wearing clashing colors, or chatting in unintelligible ways. Whatever. It’s worth the effort. You’ll see. Along with the title change to Super/System came a less frightening photo of me for the second printing of Doyle’s book. But that didn’t stop me from submitting the same original hippie picture to accompany my GT column a few years later. I still remember the panic when the column hit the newsstands. The advertising manager and Len Miller, editor-in-chief, cornered me and proclaimed that we had a crisis. The photo was scaring our advertisers. We started using a slightly more civilized image of me. Mike I love the photo, my absolute favourite though is the one in your section in Super System, almost identical to this one, but you are looking at the camera, don't you have a copy of THAT photo, I would love to print it and frame it on my wall. Look crazy, act careless, but always be careFULL!! Wow, nice hair dude.I have long hair too, and people are also scared of me, but I kinda like that they are scared of me, probably not wise huh. 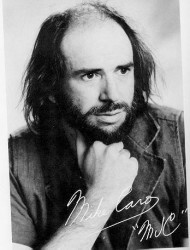 That ummmm, patch of missing hair in the middle worries me a bit, how old are in this photo Mr.Caro? Ooohhh I like the notifacation boxes at the bottom, nice. Nice photo Mike. We all have these long hair photos somewhere. I still get looks from people who do a double take…..so 30 years later I grew my hair long again….haircuts are overated anyway. I was 32 or 33 when that photo was taken. Thanks for making your first Poker1 comment. My Dad, Roger Baldwin, published a blackjack book in the 50’s. His publisher wanted a photo for the cover to help increase sales. One of his co-authors, Bill Canty was black. The publishers did not want to include him in the photo. Dad made the decision … no photo was used. Very interesting, Lauren. Thanks for sharing that. That’s an awesome picture Mike. I don’t know why, but it sort of reminds me of Barry Greenstein with long hair (young Barry). Keep up the great website! It is truly awesome that you can offer a free site from one of the greatest and experienced minds in poker.